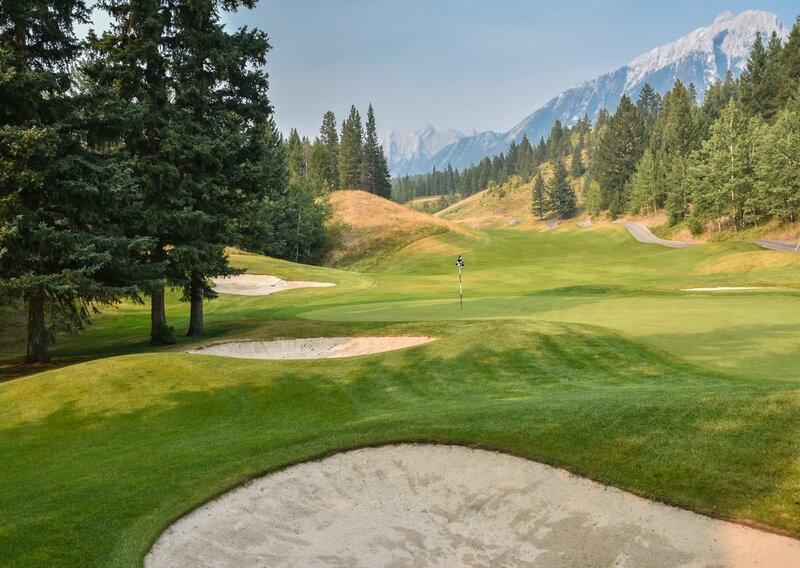 When you think of the top 5 public golf destinations in North America, do the Canadian Rockies come to mind? Probably not... but it should. For most of the US, it's a relatively short flight to Calgary and an hour or so drive into the heart of the action. Between Jasper, Banff, Kananaskis, and Canmore there are 6 courses on the trail. Let's dig into the details of my recent adventure into the Canadian Rockies and sort out the details. My partner in golf crime for the trip would be McKenzie O'Connell, most people call her Kenzie or Kenz, I decided to call her K Dawg. Now, K Dawg is a 5 handicap and certainly a valuable addition to any golf trip. She also jumped right in and showed off her impressive golf modeling chops. Things were starting off nicely. The view looking back on the restaurant atop the Banff Gondola. After getting into Banff, we took the Gondola up for a view of the local scene and had a fantastic meal at the top, courtesy of Brewster Travel. In terms of easy things to do in Banff, I would highly recommend the gondola ride. With views of downtown Banff and the surrounding mountain ranges, it was an excellent preview of what was to come. Afterwards, we headed back to our first class accommodations at the Delta Hotels Kananaskis Lodge. The hotel was centrally located in Alberta and has easy access to local hiking and biking trails with outstanding views of the Rocky Mountains. A world class spa will be opening in 2018. In the morning we were headed out to Kananaskis Country Golf Course for our first round of golf in the Canadian Rockies. 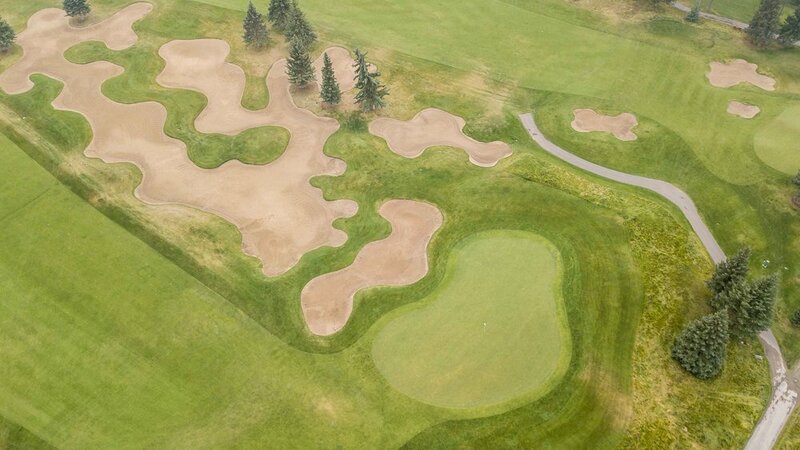 Designed by Robert Trent Jones and opening in 1983, the 36 hole layout is a favorite of local Albertan golfers. In 2013, floods seriously damaged the course and it has been shut down for the past 4 years with funding and rebuilding underway. In a sneak peak event, I was able to get some of the first photos of the new course, as 27 holes will officially open to the public for the 2018 season. You can click on any of the images throughout the post to get the full course gallery. Image courtesy of Robert Trent Drones. The dual green on the Mt Lorette 18. You can see the 9th hole on the Mt Kidd 18 still under construction below the mountains. The best part about the event at Kananaskis was the emotion demonstrated by the participants and the staff as they returned to their course after a 4 year hiatus. I watched as head professional, Bob Paley, high fived and hugged a couple of familiar faces, afterwards he would turn to our group with a huge satisfied smile on his face... "See, this is the stuff that I miss the most, the people, the camaraderie... it's just the best." Bob was immediately one of our favorite people we would meet on the trip. The only downside was that smoke from nearby wildfires would cloud the view of the normally spectacular mountains. Next up was paddle boarding courtesy of Rebound Cycle, we would change that to golf paddle boarding as K Dawg would pull off a pretty sweet trick shot effort! When traveling with a golf model, it is necessary to note that just about every location is a modeling location. Here are some of those shots from early on in the action. As a published Golf Digest model, I would push Kenzie to be the best model she could be, while providing her with the experience and modeling guidance that she needed. Next up on the Canadian Rockies agenda was Silvertip Golf Club. With 600 feet of elevation change, Silvertip offers some outstanding views of the Three Sisters and nearby mountain ranges. Unfortunately, the normally amazing views would be partially clouded by smoke. — Stephen Ames - 4 time PGA Tour winner & Member of the Canadian Golf Hall of Fame. I would come out of the gates firing with birdies on the 1st 2 holes, The flames would fizzle. With several rounds under our belt, we were ready to put the pedal down on the EZ-GO and turn up the golf action. With an early start on the Stewart Creek Golf Course, we would find our golf groove for a day of 36. Stewart creek is one of the more unique locations for a golf course as it is actually built on top of an old coal mining operation. The shafts and tunnels run beneath the golf course and several of the mine entrances are still visible on the course. We were told it was safe, but I took it easy on the divots to avoid plummeting through the fairway and into any abandoned mine shafts. A big thanks to our host Greg for helping us avoid the pitfalls! This coal mining shaft would cease operation in 1978. With several mine shafts and several models on the property, this was naturally the perfect time to start production on our 3 part series: "An Introduction to Male and Female Amateur Mine Shaft Modeling" As you can clearly see in the video, I have increased my lead in the model off competition with a score of 2-0. The stunning downhill 9th hole: I would get nasty and make a 2! From time to time, I would find a slight gap in the smoke coverage and get a shot of the mountains. These views are commonplace on all of the courses we would play in the Rockies. 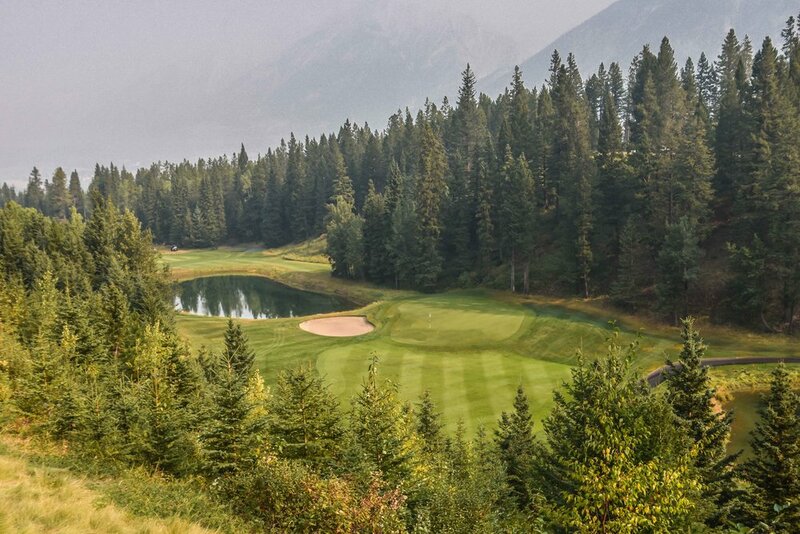 Next up on the tour of the Canadian Rockies was the highly anticipated Fairmont Springs Banff Golf Course. We were in for a treat as veteran Golf Broadcaster, Luke Elvy, would join us for the round. Luke is one of the best dudes you can play golf with and he was happy to lend advice, share stories, and even call the action as we golfed our balls. He also has an Australian accent. Kenzie would nearly make an all world 2 on the "Devil's Cauldron" Check out the video here. Even with a heavy dose of smoke covering the mountains, the Stanley Thompson course was a highlight of the trip. The course is strategic, scenic, challenging, and fun to play. A shot from behind what was originally the 18th hole. The routing has been changed due to clubhouse and capacity demands. For the final round of the trip we headed out to Canmore Golf & Curling Club. In 1926, the original course was only 9 holes with sand greens and coffee cans for holes. 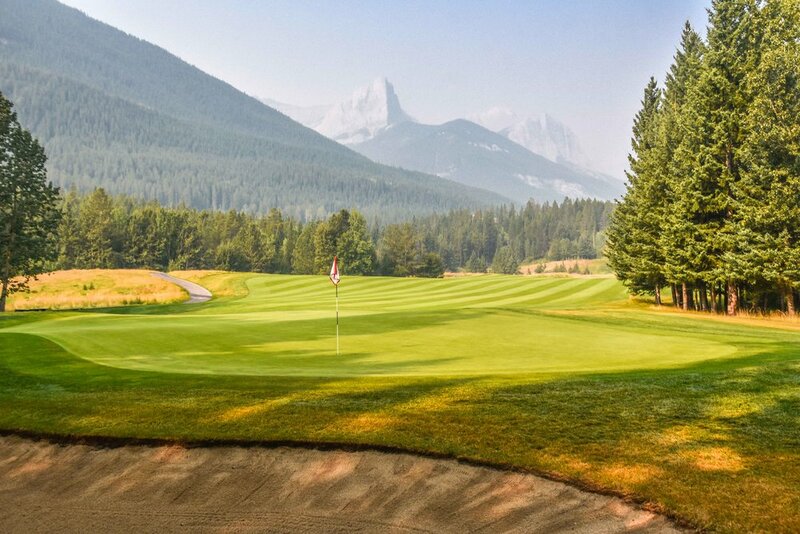 In the 1960's a curling rink would be added, and today, Canmore offers a full test of golf with stunning views of the surrounding mountain ranges. Thanks to our host Darren Cooke for showing us around. 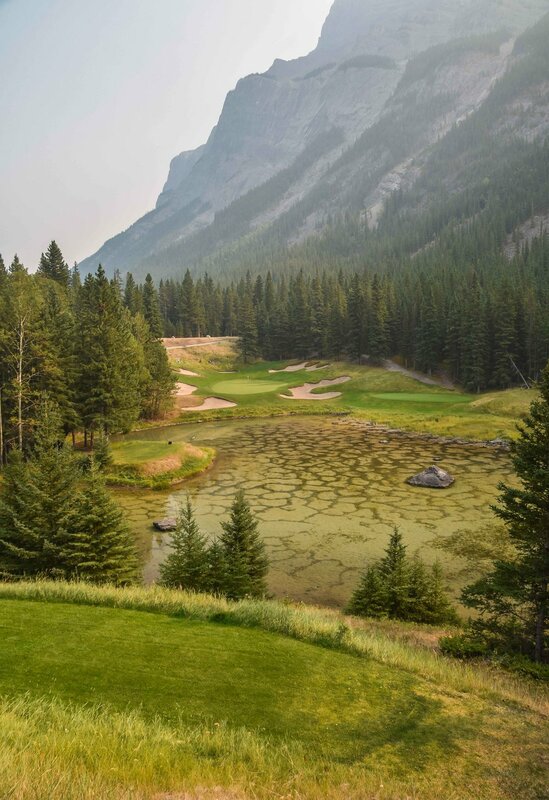 Even during a historically dry season, The short par 3 11th at Canmore Golf & Curling Club is still a stunner. Local golfing stud, Jack Stoliker would come out of the gates hot and birdie the 1st two holes. The view from above the 10th hole at Canmore. One of the most compelling parts about the Canadian Rockies is that there is a lot more than golf in the area. Even though our trip was compromised mostly of golf, the opportunities for hiking, helicoptering, kayaking, shopping, and of course, modeling, are endless. With only one day left in the model-off competition, I decided to give Kenzie a chance to even the score on the downtown streets of Banff. Naturally, K-Dawg rose to the challenge and pulled off some sort of movie shopping montage. It is important to note that the original score called for Billy Idol's Dancing with Myself. However, Billy Idol did not return our requests for copyright approval. With the score even at 2-2, a return trip is in order.